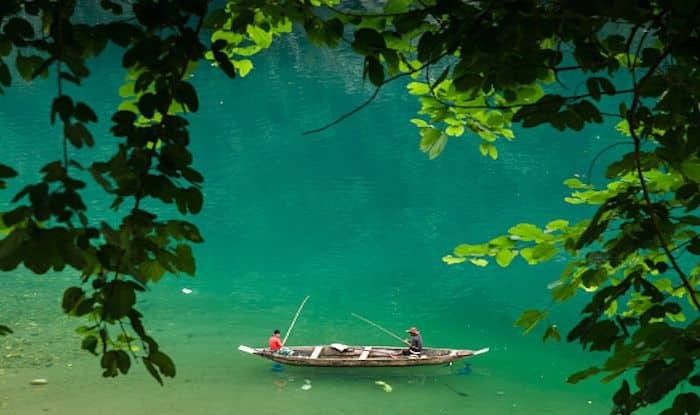 If you have to choose a place to visit in the Northeast, let it be Dawki in Meghalaya. It is a small border town along the India – Bangladesh border and the highpoint of the place is the Dawki river, also known as the Umngot river. The river is so beautiful, it looks straight out of a fairy tale. The Umngot River acts as a natural divide between Jhantia and Khasi hills, before finally flowing into Bangladesh. They say that the water of the river is so clear that the boats floating on it look as if they are on a crystal glass surface.
. – Umngot river, Dawki (2016) : . . – A A Milne In foothills of Jaintia Hills in Meghalaya, after a beautiful & long journey (~100Kms) from Shillong, you land into a small town, Dawki. Dawki is mostly known for being an important trade-pass between India & Bangaldesh. Highlight of this place was boating in crystal clear water of Umngot river, which arguably is one of the cleanest river in India. You can even see fishes swimming deep in river from boat itself…A picture perfect place to see boats floating in air. Just like in the pictures, the green of the river shines bright under the sun with colourful boats lining its shore. The transparent, emerald stream is best experienced on a snake boat. The boatman perched at one corner on one corner of the boat, with the hills making for a serene backdrop, will look like you’re being pushed towards paradise. The water is impossibly clear, you can see the river bed strewn with deep round colourful pebbles and stones. You’ll also spot alcoves hidden behind cascading water; the kinds elves and fairies hide in, in the movies. The only sounds that you will hear in the valley will be that of the gentle swishing of the river and the melodious calls of the birds. Each boat can take a maximum of five people including the fisherman. The entire boat ride takes around an hour; you cover the river along with a small island where you can get some great pictures. Travellers can even get into the water for a quick swim here since the current is not very strong. Wading through the emerald-green serpent water body threading its way through the hills, with innumerable fishermen’s boats dotting its surface, right into the plains of Bangladesh, is a sight that will stay with you long after you’ve left. The trip to Dawki can be clubbed with a visit to the root bridge village of Riwai and Mawlynnong, one of Asia’s cleanest village. All the three places fall on the same route and can be covered in the same day. The nearest airport is in Guwahati, from where you can take a car that will take you through Shillong before finally reaching Dawki. On your way to the town of Dawki, you will pass through gorges, ravines and tiny villages which do not have more than 15-20 houses and vast expanses of farmland. The best time to visit here is during the dry months of November to April. Avoid visiting Dawki in monsoon; the river is always overflowing and boating is closed.